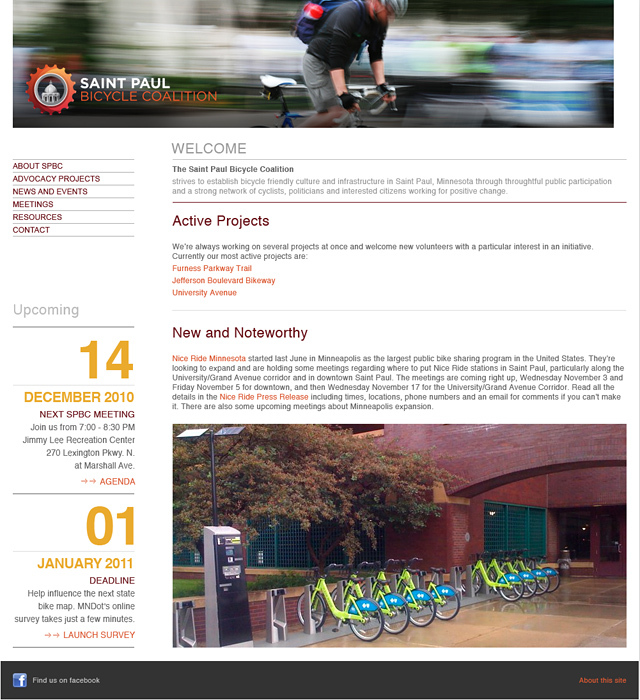 Saint Paul Bicycle Coalition - BrainstormOverload - Small design studio. Big ideas. The logo for the SPBC is a 17 tooth cog encircling the state capitol – representing the 17 District Councils in Saint Paul. I chose the cog because on every kind of bicycle it is the part that translates the rider’s energy into forward motion. It is the perfect symbol as the SPBC turns the energy of passionate advocates into forward progress. The needs a logo will be called upon to support are hard to predict in advance so we created three core configurations for the logo: stack, horizontal and left aligned. Additionally we created specific versions for facebook and the like. We also designed a clean website that could be launched quickly to get things rolling.